Disclaimer: This is not an official product review. The comments and descriptions mentioned in this article are my personal impressions and opinion based on an item I purchased myself. 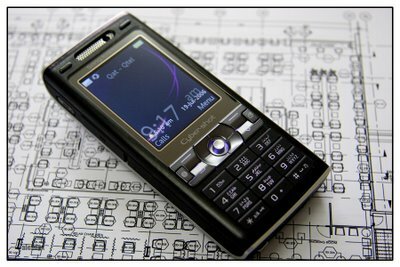 The K800i. 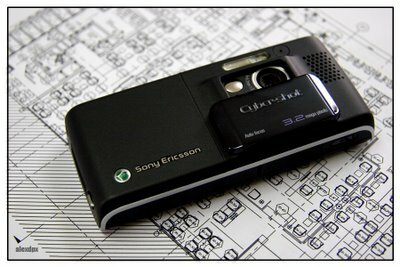 The first Cyber-shot branded Sony Ericsson Phone. Well built and its black color and elegant finishes looks very professional. Sure, it's not unique - Nokia's N80 also sports a 3 Mp camera. 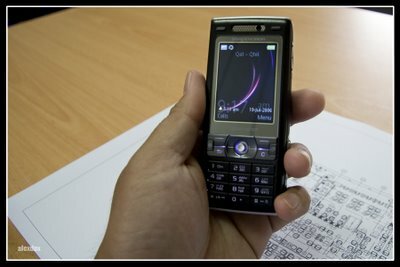 But the Sony puts into the Sony Ericsson K800i its expertise in digital imaging and branding made it the first Cybershot branded SE phone. It's predecessor, the K750i is well lauded for it's excellent 2 Mp camera (I never had one. My knowledge of it is by its reputation only.) and so much is expected of the K800i's 3.2 Mp camera. I bought one because of the camera. It's not a secret that I'm into photography and camera's arouse my curiousity. However, I did not buy this one for that reason. Since its announcement I've been reading it's specifications and pre-production reviews. The reviews were very good so I said this has got to be my next phone. Other than a serious serious hobby, I have about a hundred other uses for a camera that I need to have one with me all the time. My DSLR is big and heavy, my compact digicam is not pocket size and even if it is, it would be another item in my pocket. A 3.2 Mp cameraphone appears to be the best solution. Before this one, I had 3 other cameraphones but the quality of pictures they produce not good enough other applications other than sharing them over the internet. I need pictures that I can share, print and keep. Its a 3G phone capable of video calls. The tiny video camera is incorporated with the phone speaker. Brushed anodized black aluminum face plate is quite elegant. The LCD screen is bright and a pleasure to the eyes. Personally, I like the candy bar design. It's simple and does not have the complicated hinges of the clam shell, slide, or swivel. Simple to use and affords one-handed operation. The only thing is that your key board is always exposed and prone to accidental pushes. But that can always be solved with automatic keypad lock. Previous Sony Ericssons have colorful designs making them look youthful and fun. The K800i is black and sleek and simple. Boring you say? Business like and elegant is how I would describe it. I'm a professional and this phone looks very professional. It suits my personality. The front face plate is brushed anodized black aluminum. The rest is plastic with a satin feel finish similar to the W550i Walkman phone. Only this one is colored black. The silver line that runs and curves around the phones edges is an elegant touch. Its 3.2 Mp camera and Cyber-shot branding is what this phone really is all about. It sports a real xenon flash much like those found in compact digicams providing real flash power. The flash has 3 modes - auto, off and red eye reduction. There is no function to make the flash fire everytime. As a camera, the user interface is really good. You could use it without having to go thru the menu system. The sliding lens cover acts as the camera switch. Just slide it open and you're ready to shoot. Slide it close and the phone goes to home screen or in standby mode. In camera mode, the keypad functions as dedicated buttons for various camera controls. Just press "0" to reveal the button functions. You'll need some time to familiarize with the buttons in order to use it intuitively. But once you are familiar, the camera becomes a real camera - not just a phone feature. There is nothing revolutionary about the phone functions. Most of the features can be found in other SE phones, except for the direct blogging function. I haven't tried it along with its other internet functions because I use a prepaid account. At the moment, GPRS in Qatar is a premium reserved for post paid accounts only. The price of gas may be very low here but telecommunications and other services are not. Yes it has the standard organizer functions like alarms (there are 5), calendar, calculator, notepad, etc. Candy bar design fits perfectly in my hand. It plays MP3 music as well just like SE's Walkman phones. But this is being marketed more as a Cyber-shot phone so it does not sport the Walkman badge and comes with a standard earphone set and only 64Mb of internal memory. But it doesn't matter, I prefer the convenience of an external memory card. Memory Stick Micro. You should be careful when handling one of these because losing it is quite easy - microscopic indeed. 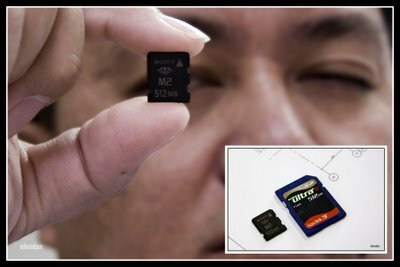 Inset, that's the gigantic Secure Digital (SD) card. Yes, it's another version of the Memory Stick and that's what I do not like about Sony. It seems everytime they introduce a new gadget, it always come with a new media format that is not compatible to use with other gadgets and usually don't last for very long. Remember the Betamax, the MiniDisc, the MicroMV and it looks like the original Memory Stick is on its way to being scrapped in favor of the smaller Memory Stick versions. It defeats the purpose of reusability because when your gadget's lifetime has expired, your media format expires with it. And it is, of course, additional expense to consumers like me. I prefer the idea that Canon (although not a mobile phone manufacturer by any means) has stuck to the Compact Flash (CF) and Secure Digital (SD) card formats. I have a CF card from my old Minolta Dimage digicam which I bought in 2001 that I can still use today with my Canon Powershot and EOS cameras. Going back the MS Micro, it is ubelievably small and one should be very careful with handling it because it is not difficult to lose it. It is, however, amazing how much memory can fit into such a microscopic card. I bought a 512 Mb card although 1 Gb cards are available. That suits my needs just fine. I just hope Sony sticks to this format long enough so I can use it again when the time comes for this phone to be replaced. My fascination with camera phones. 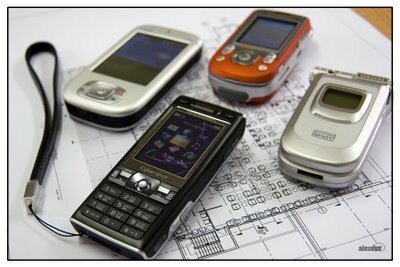 Clockwise from top left: iMate JAM (O2 Xda Mini), Sony Ericsson W550i, Samsung SGH-V2000 and my new Sony Ericsson K800i. 1. The keypad is too small for my thumb. It is a little bit of a struggle to compose text messages at the speed I am used to. Even when dialling for a call, I had to look at the screen and make sure I keyed in the correct number. 2. So are the multi-function keys. I often use my pinky nail to press the shortcut key on the right side of the multifunction keys. 3. The multi-directional joystick in the middle is very soft and not precise. When you press it down to enter your selection, it sometimes moves the cursor into different directions and vise versa. 4. Because it now uses a xenon flash instead of LED, it looses the very useful function of a torch when doing inspections in areas where I need a flashlight. 5. The flash does not fire on demand. Which means you don't get the benefit of fill-flash when you need one to soften harsh shadows. 6. The camera exhibits a considerable amount of shutter lag. I tried once to take a candid picture of a colleague and I'm sure she was smiling with eyes opened wide when I pressed the shutter button. But I ended up with a picture of her eyes closed - she has already blinked when the shutter fired. 7. Although autofocus is a welcome function for a cameraphone, it is rather slow and tend to search most of the time - even in bright lighting. 8. No manual camera controls but I guess that's too much to ask for a camera phone. The scene modes are good enough to handle general photography uses. It's not perfect but it's probably the best phone of it's kind I've heard that Nokia's N80 is also an excellent phone but it's 3 Mp camera is not something to be desired. Overall, I think the K800i is a very good first attempt to incorporate the Cyber-shot brand to the Sony Ericsson phone. There's plenty of room for improvement (like the items mentioned above) and Sony only needs to listen to its customers. So what's the image quality like? Well, you'll have to read my next post. While I will be describing my impressions, I will also post sample photos viewable in their full 3.2 Mp resolution so you can judge for yourself. Great Phone held battery life long period of time 3-4days when charger worked.